They have a set of 4 (which is what I needed) for only £28 (£7 each). This was by far the cheapest price I had seen so I was going to buy these. Delivery is £3.50 however I rang my local store and they stated they had some in stock for collection (could not arrange this online had to do it by phone). I already had some fence posts from Wickes (I bought the slotted type which I could not use) so went to take them back and noticed a big sign saying they price match and beat by 10%. The terms and conditions can be found online and it stated that the pack size must be the same and store within 10 miles etc... so I was not sure if they would match or not. The woman at the till said that they would match and knock off 10% and would do this for a single post i.e. £7 - 10% = £6:30 per post. The Wilkinson deal is a really good one but the Wickes one seems incredible. I even checked my local builders and timber merchant and they could not match it. I wanted the 2400 x 75 x 75mm ones but they do have different ones in Wilko such the below (not to mention packs of 5 and 6). I posted the Wilkinson's deal as that is guaranteed where as the Wickes one seems to be down to the manager but both seem far cheaper than anywhere else I could see other than one or two online sites where you had to wait a week for delivery. NY Timber in North Shields for £3.50 each. Cold from me I'm afraid. That price is insane. Try a local timber yard, I've just bought 75 x 75mm … That price is insane. 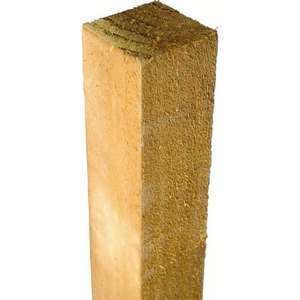 Try a local timber yard, I've just bought 75 x 75mm x 2.4m posts fromNY Timber in North Shields for £3.50 each. Cold from me I'm afraid. Thanks for that, unfortunately Yorkshire is a bit far for me and all the places in Cardiff were charging £9 or more and many needed proof of trade (which I am not). It just shows how much companies make though as wickes before the price match charge £12.48 and others such as B&Q were even more. The concrete ones would be my first choice but they wont work for what I need (3ft panel at the top of an existing brick ball). I went to get the wooden slotted ones (the ones I returned to wickes) but they would not work either (20ft washing line in the way which was not worth the hassle to move). This is what I did as I did not want to wait for a delivery but as I had to return the slotted ones I thought I would ask Wickes to price match, which they did. I thin the larger Wilko stores with an outdoor gardening section will have these in stock while the smaller ones in the city centre may not. Nice one, live close and was wondering what kind of prices I should be paying for these.